His Highness Sheikh Mohamed bin Zayed Al Nahyan, Crown Prince of Abu Dhabi and Deputy Supreme Commander of the UAE Armed Forces, and Mohammed bin Salman bin Abdulaziz Al Saud, Crown Prince, Deputy Prime Minister, Minister of Defence of the Kingdom of Saudi Arabia and President of Saudi Council of Economic and Development Affairs this evening chaired the first meeting of the Saudi-Emirati Coordination Council in Jeddah. During the meeting, the Saudi-Emirati Coordination Council's Organisational Structure was declared with the objective of accelerating joint co-operation on the implementation of targeted projects and programmes. The Council's vision aims to promote the two countries' global stature in areas of economy, human development, and political, security and military integration as well as ensuring welfare and happiness for their peoples. 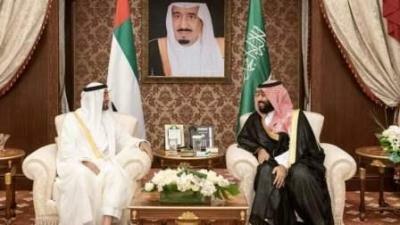 Established under an agreement between the two countries reached in May 2016 under the directives of President His Highness Sheikh Khalifa bin Zayed Al Nahyan and Custodian of the Two Holy Mosques, King Salman bin Abdulaziz of Saudi Arabia, the Council stands as a role model for cooperation between world countries and in the meantime consolidates joint action between GCC states. Chaired by His Highness Sheikh Mohamed bin Zayed Al Nahyan, Crown Prince of Abu Dhabi and Deputy Supreme Commander of the UAE Armed Forces, and Prince Mohammed bin Salman bin Abdulaziz, the Saudi Crown Prince, Vice President of the Council of Ministers, and Minister of Defence, the council seeks to ensure synergy between the two sides on achieving joint initiatives conducive to providing job opportunities, boosting GDP and accelerating bilateral investments. The council seeks to develop a joint vision to deepen bilateral relations in line with the objectives set by the Gulf Cooperation Council in order to strengthen economic integration between the sides and develop innovative solutions for the optimum utilisation of resources while building up an efficient and integrated education system premised on grooming qualified national generations. The council also seeks to strengthen cooperation in areas of politics, security and defence in a way that beefs up the global sovereign standing of the two countries in addition to making the best use of available partnership opportunities between the two countries through a clear-cut and sustainable mechanism based on an integrated approach of benchmarking and performance assessment. Attending the meeting were Sheikh Tahnoun bin Zayed Al Nahyan, National Security Adviser, Sheikh Mansour bin Zayed Al Nahyan, Deputy Prime Minister and Minister of Presidential Affairs, Sheikh Abdullah bin Zayed Al Nahyan, Minister of Foreign Affairs and International Cooperation, Sheikh Zayed bin Hamdan bin Zayed Al Nahyan, Sheikh Shakhbout bin Nahyan Al Nahyan, UAE Ambassador to Saudi Arabia and a number of ministers. The Council includes 16 ministers from prioritised sectors from both countries as follows: Mohammad bin Abdullah Al Gergawi, Minister of Cabinet Affairs and The Future; Sultan bin Saeed Al Mansouri, Minister of Economy; Dr. Anwar bin Mohammed Gargash, Minister of State for Foreign Affairs; Obaid bin Humaid Al Tayer, Minister of State for Financial Affairs; Hussain bin Ibrahim Al Hammadi, Minister of Education; Dr. Sultan bin Ahmad Sultan Al Jaber, Minister of State; and Ali bin Hammad Al Shamsi, Deputy Secretary-General of the Supreme National Security Council. From Saudi Arabia, the Council includes the following members: Prince Abdulaziz bin Saud bin Nayef, Minister of Interior; Prince Badr bin Abdullah bin Mohammed bin Farhan Al Saud, Minister of Culture; Mohammed Al Tuwaijri, Minister of Economy and Planning; Dr Majid bin Abdullah Al Qasabi, Minister of Commerce and Investment; Adel bin Ahmed Al Jubair, Minister of Foreign Affairs; Khalid bin Abdulaziz Al-Falih, Minister of Energy, Industry and Mineral Resources; Ahmed bin Aqeel al-Khatib, Board Chairman of the General Entertainment Authority; Mohammed A. Al-Jadaan, Minister of Finance; and Yasir bin Othman Al-Rumayyan, Chief Executive and Secretary-General of the Board at Public Investment Fund. In order to ensure the best utilisation of partnership prospects, an executive committee has been formed under the chairmanship of Mohammad bin Abdullah Al Gergawi, and Mohammed Al Tuwaijri, to accelerate co-operation and follow up the progress of work.